Have you seen that show on TLC? My Strange Addiction? Yeah, the one where a chick eats Comet, and another one eats couch cushions. My addiction isn’t that strange… but what it is – is in fact, an addiction. I cannot get enough of it. No- it’s not drugs, alcohol or chocolate. I know, kind of random, but kind of not, considering I am part asian so I should be born to love seaweed. I’ve always loved seaweed salad at Japanese/sushi restaurants. 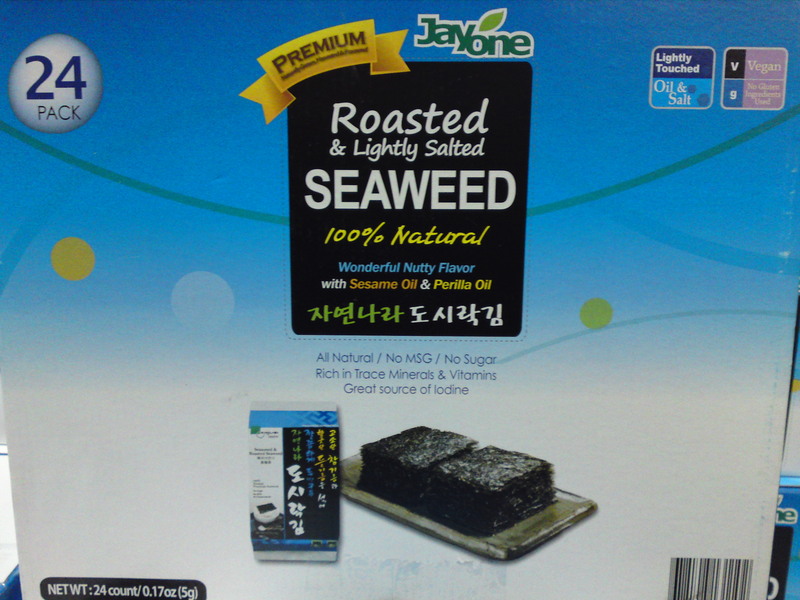 But it wasn’t until I was trapped in a Korean Market, and by chance grabbed sheets of Laver Seaweed (Nori), as a ‘snack’ for bookclub… that I became hooked. Like crazy hooked. The sheets of laver came four to a package, and four packages of the 8×10 sheets were contained in one unit. I bought one, thinking, “how cute, there’s a beer mug on the front of it,” not knowing that I would basically stuff my face with all but one package (I put out for the bookclubbers) in a matter of two days. The flaky, salty texture, and the olive oil used on those Laver sheets were heaven. No matter that I resembled Maya Rudolph and Kristin Wiig in the cafe scene of Bridesmaids. About a month ago, I went to a birthday party in the park. It was potluck style and someone had brought small, 2×4 inch sheets of nori- about six mini-sheets to a package. Yeah, ate ’em up. All the packages I could find without looking like a psycho. A week later? At a friend’s house. She made yummy dinner. So yummy, I was full. Until, out of the corner of my eye- yep, the damn seaweed. I asked if I could just have one package. I think I ended up eating two, and she was so impressed with my love for seaweed, she gave me a 24-pack from Costco. A 24-pack! She told me not to eat it all in one day. I didn’t. I actually went out of town and forgot I had the box altogether until I found it yesterday, and ate… five packages in a row. I filled up half my trash bin with the containers (not the most ecological packaging around.). It’s kind of out of control. So there you go. 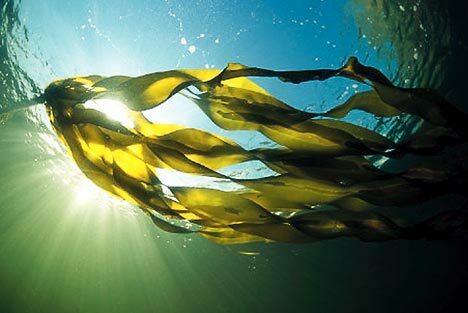 What’s crazy cool is that one sheet of Nori seaweed has as much fiber as a cup of raw spinach and more omega-3 fatty acids than a cup of avocado. Uh, say what? Who knew? What types of seaweed are there? Well, here are some types, thanks to Oprah.com… and apparently, all are available at WholeFoods. Nutritionist Gillian McKeith, PhD, author of the You Are What You Eat Cookbook, calls wakame the woman’s seaweed because it is loaded with osteoporosis-preventing calcium and magnesium and acts as a diuretic (which helps reduce bloating). Wakame’s pigment, fucoxanthin, is known to improve insulin resistance, and a 2010 animal study found that fucoxanthin burns fatty tissue. Soak the leaves in cold water until tender, then enjoy them in a cucumber salad, dressed with rice vinegar, sesame oil, and soy sauce. To make miso soup, add wakame, tofu, and a few tablespoons of miso paste to a kombu stock. Among the marine flora, nori is one of the richest in protein (up to 50 percent of the plant’s dry weight), and one sheet has as much fiber as a cup of raw spinach and more omega-3 fatty acids than a cup of avocado. Nori contains vitamins C (a potent antioxidant) and B12 (crucial for cognitive function) and the compound taurine, which helps control cholesterol. 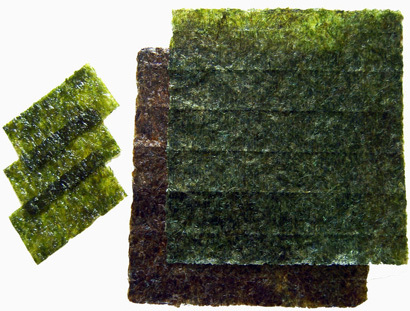 For a snack, toast strips of nori in the oven at low heat. Or cover a sheet with cooked brown rice; add a layer of sliced carrots, celery, or avocado, and a dash of wasabi. Roll it up and dip in a sauce of tamari, toasted-sesame oil, ginger, and rice vinegar. Or eat as is! Kombu is prized as a source of iodine, which is needed to produce the two key thyroid hormones that control metabolism. The kelp is also rich in fucoidan, a phytochemical that acts as an anticoagulant; a 2011 study found that kombu contains properties that stop clots from forming in blood vessels—which may make it a promising subject for cardiovascular research. To make a flavorful broth called dashi (the chicken stock of Japan), simmer a strip of dried kombu in water for five minutes. And next time you cook beans, throw a kombu leaf in the pot; the plant’s glutamic acid renders the beans more easily digestible and less gassy. Arame provides a good amount of potassium, a mineral known among athletes for preventing muscle cramps. Research has shown that arame has antiviral properties, too, and even an antiobesity effect: In a 2010 experiment, researchers discovered that mice on a high-fat diet experienced less weight gain when their food was supplemented with arame powder. Soak the strands in cold water for five minutes. To make a summer salad, toss them with pasta, sautéed mushrooms, tomatoes, basil, and olive oil. 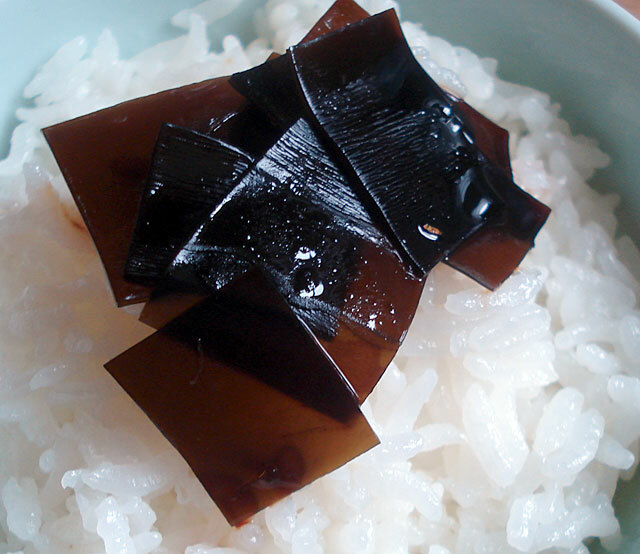 Dress up any cooked grain with chopped arame. Or add to stir-fried vegetables; arame pairs well with turnip and squash. Don’t dog on the weed- try some, you may be surprised. I know I was and can’t get enough of it!!! I didn’t know! Especially since I was offering you snacks. I have a stack of nori in my pantry. It’s my grab and go snack when I’m in the car all day and can’t sit down for a meal on time. And if I’m too lazy to cook, I just eat it with rice and kimchi. If you haven’t yet, try the wasabi flavor from Trader Joe’s. ooh- thanks, Ana- I’ll check it out!! I’ve recently became obsessed about a few months ago, with the dry seaweed sheets! I absolutely love eating them, I get them at an Asian supermarket they come in 10 packets in one big pack.